Britain was denied a speaking slot at a Haiti donors’ conference in New York yesterday after it failed to come up with any new aid money for the earthquake-ravaged nation. The British Government was upstaged by its international partners as the United States and other European nations pledged billions of dollars towards Haiti’s $3.8 billion (£2.5 billion) reconstruction plan. About 138 nations attended the conference at the UN headquarters, with the aim of helping the shattered Caribbean country to “build back better” after the 7.0-magnitude quake on January 12 that killed at least 220,000 people and left 1.3 million homeless. The conference was chaired by René Préval, the Haitian President, alongside Hillary Clinton, the US Secretary of State, and her husband, Bill, the former US President, now the UN special envoy for Haiti. Britain’s seat was taken by its deputy UN permanent representative, Philip Parham, filling in for his boss, Sir Mark Lyall Grant, who is on leave. Instead of a speaking slot, British diplomats were reduced to posting a prepared statement on a UN website. 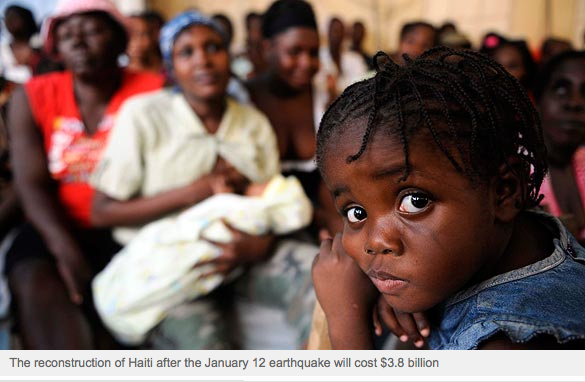 The US announced $1.15 billion (£760 million) to help to rebuild Haiti. Baroness Ashton of Upholland, the EU foreign policy chief, pledged €1.235 billion (£1.1 billion) from its member states. The European Commission gave €60 million. The top contribution from an EU member was from Spain, which gave €346 million. France, Haiti’s former colonial master, pledged €236 million, while Germany contributed €39.4 million and the Netherlands €29 million. Britain contributed nothing to the new UN aid, putting it in the company of Austria, Bulgaria, Greece, Hungary, Lithuania, Malta, Portugal and Romania. An EU factsheet noted, however, that the British public had been considerably more generous. Private contributions from Britain have hit €100 million (£89 million), the largest sum of any EU country but Germany, where the public donated €195 million. British ministers made the judgment that any British reconstruction aid should be channelled through multilateral institutions. Mike Foster, the Overseas Development Minister, said that Britain had pledged £20 million for initial emergency relief and had donated £33 million going through the European Commission, the World Bank and the Inter-American Development Bank. Mr Foster also counted Britain’s £29 million funding this year for the UN mission in Haiti — even though Britain is obliged to pay for the peacekeeping operations, which existed long before the earthquake. To allay concern about corruption, the new reconstruction aid will be channelled through an Interim Haiti Recovery Commission, co-chaired by Mr Clinton and the Jean-Max Bellerive, the Haitian Prime Minister. The commission’s members will include Haitian legislators, local authorities, union and business representatives and a delegate from the 14-nation Caribbean Community trade bloc. Every donor who pledges at least $100 million over two years, or $200 million of debt reduction, will also have a seat on the board. ← FLASH-FLASH-FLASH March 30, 2010 PREVAL WILL SEEK AN 18 MONTH EXTENSION FOR HIS ALREADY DISASTROUS, DO-NOTHING PRESIDENCY.